Simpsons Comics #245 is the two hundred and forty-fifth and final issue of Simpsons Comics. It was released on October 17, 2018. "It’s a Simpsons Comics send off! 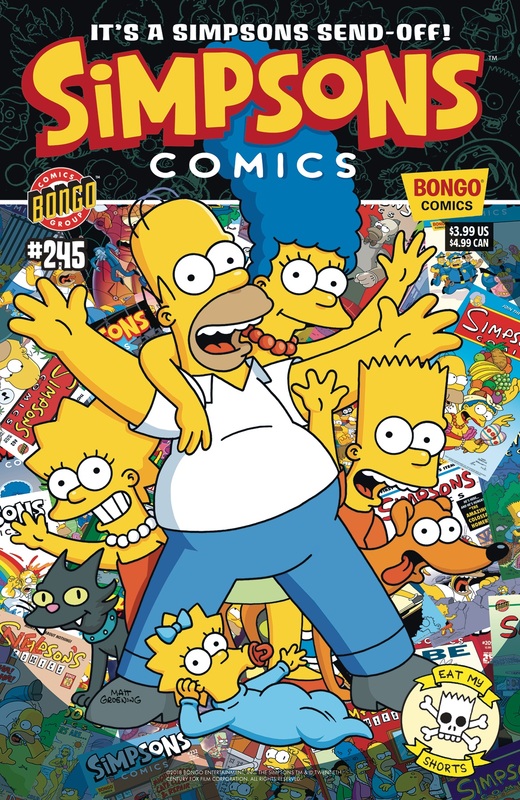 Join Bongo for the final issue of Simpsons Comics in a series finale that’s been 25 years in the making! When Lisa brings home a lovable new pet from All Creatures Great and Small and Cheap, it seems like the perfect gift. But this new addition to the family turns out to be much more than anyone could have expected, and soon Springfield itself is in danger. Only one person can save the town from total disaster, but they’re too busy taking a nap! It’s a tale of twists, turns, irradiated missteps, and surprise cameos that will have your head spinning, bosom heaving, and wallet screaming to be emptied! A heartfelt series farewell from your pals at Bongo. We hate to say goodbye, so let’s just leave it at “Smell ya later!”"
Main article: Bye, Bye, Bunny! ↑ Newsarama - "SIMPSONS COMICS Ending After 25 Years, With Questions About BONGO COMICS' Future"
Modified on January 7, 2019, at 15:57.